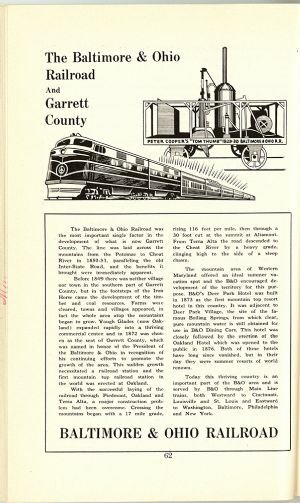 The Baltimore & Ohio Railroad was the most important single factor in the development of what is now Garrett County. The line was laid across the mountains from the Potomac to Cheat River in 1850-51, paralleling the old Inter-State Road, and the benefits it brought were immediately apparent. Before 1849 there was neither village nor town in the southern part of Garrett County, but in the footsteps of the Iron Horse came the development of the timber and coal resources. Farms were cleared, towns and villages appeared, in fact the whole area atop the mountains began to grow. Yough Glades (now Oakland) expanded rapidly into a thriving commercial center and in 1872 was chosen as the seat of Garrett County, which was named in honor of the President of the Baltimore & Ohio in recognition of his continuing efforts to promote the growth of the area. This sudden growth necessitated a railroad station and the first mountain top railroad station in the world was erected at Oakland. With the successful laying of the railroad through Piedmont, Oakland and Terra Alta, a major construction problem had been overcome. Crossing the mountains began with a 17 mile grade, rising 116 feet per mile, then through a 30 foot cut at the summit at Altamont. From Terra Alta the road descended to the Cheat River by a heavy grade, clinging high to the side of a steep chasm. The mountain area of Western Maryland offered an ideal summer vacation spot and the B&O encouraged development of the territory for this purpose. B&O's Deer Park Hotel was built in 1873 as the first mountain top resort hotel in this country. It was adjacent to Deer Park Village, the site of the famous Boiling Springs, from which clear, pure mountain water is still obtained for use in B&O Dining Cars. This hotel was closely followed by the erection of the Oakland Hotel which was opened to the public in 1876. Both of these hotels have long since vanished, but in their day they were summer resorts of world renown. Today this thriving country is an important part of the B&O area and is served by B&O through Main Line trains, both Westward to Cincinnati, Louisville and St. Louis and Eastward to Washington, Baltimore, Philadelphia and New York.